As for Yahoo Go!, I tried version 2.0 but didn’t like it. I prefer doing everything in the browser, It takes longer to start Go! and have it retrieve the latest email headers than to just load mail.yahoo.com in Opera Mini. Plus when you follow a link in an e-mail, Go! uses it’s built-in mini-browser to show a transcoded copy with no way to open the original in a real browser. Go! 3.0 is out now. Maybe it’s better. I haven’t tried it yet, I’ve you have please leave a comment with your experiences. I’ve also used gMail’s “Basic HTML” version on the phone and it works perfectly with Opera Mini. I’d switch everything to gMail but for one thing. In an effort to reduce SPAM, I try to keep my primary email address somewhat hidden and use alternate addresses that I can delete when they start getting too much junk mail. In gMail, when I reply with an alternate address, Google still shows my primary gMail address in the Sender: and Return Path: headers. Yahoo doesn’t do this. Google says this to “help prevent your mail from being marked as spam.” No one’s ever complained about my email being “marked as spam”, but I do know that by revealing my “real” address, Google is subjecting it to SPAM. “We Have run into a problem processing your last request! Please try again later. Well, I started using the Beta again last week, read dozens of emails and sent a few and so far I haven’t seen that or any other errors. Finally, a single Y!Mail client where I can move mail to folders and follow links and have them open right in Opera Mini. The Beta is my new preferred way to use Y!Mail on my phone. There are some nice touches in the Beta, I like that when I get to the bottom of a message there’s a menu (2nd image) with choices for disposition of the message; Delete, Move, Reply, etc. I’ve also started using the Beta’s personalized home page to check news headlines, local weather and (falling) stock market. The portal (bottom image) is pretty slick with lots of predefined content modules to chose from, even a WapReview snippet :). Plus you can add your own links to any sites. Not that the Y! Mobile Beta is perfect. I wish the end of message menu had a Next link for those times when I want to leave a message in my inbox (so I can reply later from a PC) and go on to the next one. True, there is a Next link at the top of the page but it would be nice to have one at the bottom too. 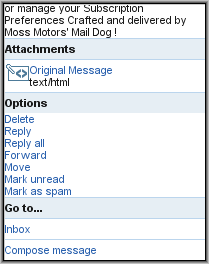 And there is an annoying bug in the display of both mail headers and news headlins. The text wraps at 160 pixels instead of using the full width of the screen. You can see this in the first and last images on this page. It looks ugly and is harder to read. This doesn’t happen with all browsers, the full screen width is used in S60WebKit for example. I looked at the markup and Yahoo is using a layout table with a cell width of 160px for Opera Mini. I guess this is meant to be a compromise as Mini runs on devices with varying screen sizes. I wonder why they don’t just set width to 100% and let Mini deal with fitting it to the screen? Yahoo has been rolling out the Beta incrementally. It orginally worked on only a handful of phones but support seems to be pretty widspread, It’s available with Opera Mini and in the built in browsers of three of my test handsets, the N95-3, Motorola Z8 and Motorola i855, but not on a Nokia 6200. I’m in the US, I don’t know about the Beta’s availability in other markets. Forward the email with the attachment to Gmail which can display images, .doc and .pdf attachments on most mobiles. Dear Sir/Madam, I have a problem when I get an e-mail which has an Attachment as it is impossible to view a Basic HTML with Yahoo Mobile( I use Nokia Classic 311O ). I need your assistance. Thanks. I’ve noticed that too. Yahoo’s new mobile sites don’t seem to retain your login credentials between sessions. Fortunately I’m using the Opera Mini 5 Beta which has a password manager. The beta site has gone into service but as far as I can tell this is way more tedious than using a client on your mobile device. You have to pull up the website and log-in every time again (ID and PW). On my Nokia E51 I connect to my gmail account with one click. Is there any way around this? Hi Dennis. The yahoo mail beta works now and its superb. Thanks a million for letting me know about it :). The “Manage Messages” link is also missing in the beta from their existing WAP site. It made weeding out messages much easier …. we need it back! My mobile(SE Z550) mail client too shows the disguised address. Anyway, spam is a spam even if a single client jeopardizes your privacy. Btw, i still get nothing but “server timed out” or “could not locate remote server” @yahoo beta mail :(. May be it is yet to be extended for the Asia domain. Those headers aren’t displayed by default by most email clients. You can see them in gMail’s PC “Standard” version if you open an email and choose “Show original” from the dropdown at the top right of the message next to the “Repy” button. *doh*. Silly me. I should have noticed that “show original” option. Well btw, my opera desktop mail client doesnt suffer from this issue. it only shows the diguised address. I would test the case with the mail client of my phone and report back. I’m loving the new Yahoo! beta mail. They’ve incorporated a significant number of upgrades that make reviewing my mail much less tedious and time-consuming. There are still some changes I’d like to see, namely some separation between the navigation buttons but they’re headed in the right direction. 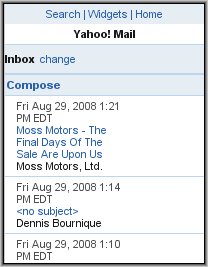 In Y!Mail’s “Classic” PC version click the “Full Headers” link at the bottom right of a message. 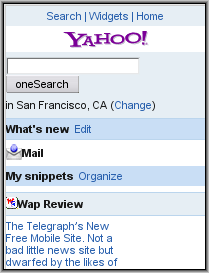 I didnt know about the yahoo mail beta service before *yikes*. But unfortunately i only got server timed out the few times i tried to sign in :(. And btw, the “send mail as” service of gmail works perfectly for me. The mail i send doesnt mention anything about my primary gmail address at all. Did you click on “make default” under the preferred “send mail as” address?